NT-MAX is our Strongest Commercial Grade Clogged Septic, Cesspit, Leach Field, Sand Mound and Drainfield Product Available on the Market Today! Our Powerful Bacterial Strains are the Fastest, Most Effective and Strongest Strains in our Arsenal. NT-MAX Continually Produces Enzymes that Aggressively Digest and Consume Sludge, Grease, Fats, Paper and all Other Organic Matter Clogging Your Entire Septic System. 600 Trillion Bacteria Thrive in extreme temperatures. Industrial Strength Septic Treatment. 100% Natural, Environmentally Safe, our Strongest Product Available. Restore Clogged Septic and Drain field Systems and Eliminate Pump-Outs. *NT-Max is 100% Guaranteed in writing to Outperform all others! NT-MAX powder treatment comes in pre-measured biodegradable bags ready to flush down your toilet once per month to assure healthy and aggressive bacterial colonies will be present in your entire system. These colonies quickly multiply upon entering your system as the bacterial/enzymes rapidly get to work digesting the buildup in your pipes, tank, d-box and leach lines. Solids within your system, blockages and compacted soils in your drain field are digested and broken down into water and oxygen. Fatty acids are consumed and odors disappear! NT-MAX multiplies rapidly while aggressively massive amounts of sludge and organic matter in a 24 hour period in commercial systems. System performance is restored to original condition while powerful bacterial strains continually digest blockages and organic matter in your drain field, leach field, cesspit and sand mound system (see below). "Clogged Septic and Drain field systems are bombarded with 600 Trillion bacteria in NT-MAX - quickly reversing damage caused by years of sludge buildup and household chemicals while doubling in numbers every 20 minutes to continually digest all organic matter. " 600 Trillion bacteria rapidly get to work at digesting and breaking down even the most compacted soils and sludge clogged pipes. NT-MAX bacterial enzymes digests enormouse amounts of the sludge and Bio-Mat clogging your pipes, lines, field, cesspit and tank in a 24-hour period. Our superior enzymes rapidly digest septic system contents such as (1) proteins; (2) oils, fats and grease; (3) sugars, starches, and complex carbohydrate chains; (4) Soap and laundry detergents; (5) phenols; and (6) toilet or waste papers. NT-MAX digests and dissolves ALL organic matter, digesting and degrading compacted sewage and bio-mat into harmless air and minerals. Harsh chemicals simply free up some blockage material while flooding your system with deadly toxins. NT-MAX is 100% safe for the environment and will not harm people, pets, grass, pipes or livestock. NT-MAX is hands down one of the most potent commercial grade bacterial remediation treatment available anywhere. NT-MAX remediation technologies are used throughout the globe from multi million dollar corporations to personal RV holding tanks. Our extremely aggressive bacterial strains are by far some of the strongest available products available. From the Galapagos Island Oil spill to the more recent Hurricane Katrina disaster, bio-remediation technology is a key ingredient to clean and eco friendly wastewater treatment. Clogged systems generate an enormous amount of pressure due to gas buildup generated by the decay process. NT-MAX lowers pressure and frees up overall capacity in your system which allows normal flow and drainage to begin again. By eating and digesting the overflow and blockages, new solids are digested by the reestablished bacterial colonies allowing only septic effluent to flow to your drainfield, cesspit or sand mound. NT-MAX digests blockages in the drain field and lines, and reverts a clogged, weakened system back to brand new condition. Your system dries up, the smell goes away and only light maintenance may be required to assure future healthy bacterial counts. NT-MAX reduces the overall strain on your entire system from tank - to D-Box or cesspit, to drain field or leach lines -while adding maximum lifespan to your system. Ideally, septic systems operate successfully and are self sufficient, however, bleaches, cleaning products, washing powders, medicines, cold weather and high water flows are some of the reasons for tank and drainfield failure. In most cases, odors, blockages, backups, wet spots and noises in the drainfield occur and can be serious problems at worst or unhealthy nuisances at least. 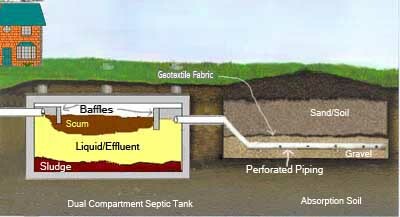 Untreated or poorly maintained septic systems can develop severe Bio-Mat (undigested raw sewage) and grime buildup throughout the entire system including the tank, lines, mound, cesspit or drain field. As sludge builds up, system performance degrades steadily and eventually fails. Most systems fail in the drain field where the field lines progressively clog to a point where degradation and digestion is inhibited. The lines have small perforations that allow effluent to pass into the surrounding gravel bed to further digest and degrade. In trouble systems, the soils surrounding the inner pipes becomes extremely compacted, not allowing effluent to pass and leading to backups and wet spots. Many common household products severely diminish bacterial counts in the system leading to most all septic system problems. With NT-MAX, you do not have to change your lifestyle. NT-MAX is resistant to most household chemicals and will ensure that your system contains suitable bacteria counts for normal future function. To date, our success rate is 100% and our products are guaranteed to eliminate sludge and alleviate your septic system blockages. Backed by over 70 years of network research and support, NT-MAX products continue to be a world leader in bio-remediation and septic system sludge degradation. NT-MAX Septic Tank Treatment can save you tens of thousands of dollars in repair or replacement costs and can have your system up and running in a matter of days. Septic tank systems and drainfield replacement can run $5,000 to $30,000 and in most cases is an unneeded burden on your finances. NT-MAX is highly effective in cesspits, leach fields, drain fields, sand mounds, drywells, RV’s, farm animal waste lagoons, food processing plants and even compost heaps. NT-MAX is approved for all septic system applications and is completely harmless to the internal mechanics of your system. Chemical products are hazardous to people, neighbors, pets and the environment and their detrimental dislodging actions can further force solids deeper into your drainfield. Our wholesale pricing models save you more than 50% over typical retail pricing while providing you with our strongest possible bacterial septic treatment for your home. See How NT-MAX Stacks up to the Competition! © Copyright 2007 NewTechBio USA All Rights Reserved NewTechBio USA provides one of the most powerful clogged septic cleaning enzyme and bacterial septic treatments on the market in a powder or liquid form. Clogged septic systems and clogged drainfields can cost tens of thousands of dollars to replace. NT-MAX contains 600 Trillion bacteria per treatment and can completely restore your clogged septic and drainfield to full functionality. On item #680 and #708 only. Other items may exclude shipping.